Lavender oil could be used to combat the increasing incidence of antifungal-resistant infections, according to a study published in the Journal of Medical Microbiology. The essential oil shows a potent antifungal effect against strains of fungi responsible for common skin and nail infections. This group has demonstrated that these oils work by destroying fungal cells by damaging the cell membrane. They believe that further research into the mechanisms by which this essential oil works could have significant clinical benefits. 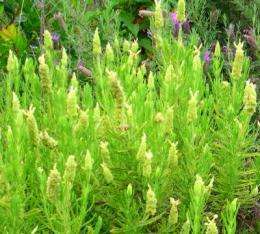 "Lavandula oil shows wide-spectrum antifungal activity and is highly potent. This is a good starting point for developing this oil for clinical use to manage fungal infections. What is now required is clinical trials to evaluate how our in vitro work translates in vivo," said Professor Salgueiro. Finally! Hope for my pungent bipedal maneuvering system. (my wife will love this!) Off to the health-store!